Tim Karkatselos was born in New York City, New York. 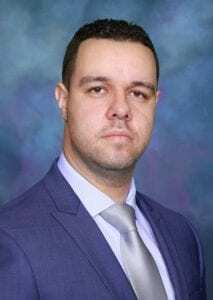 Mr. Karkatselos earned a Bachelor of Arts degree in Political Science with a minor in Law and Justice from Eckerd College in St. Petersburg, Florida. He then went on to earn his Juris Doctor from St. Thomas University School of Law in Miami, Florida, graduating with honors. While in law school, Mr. Karkatselos was a member of the Moot Court Honor Board and served as an articles editor for the St. Thomas Journal of Complex Litigation. Prior to joining DRBDC, Mr. Karkatselos worked as a prosecutor for the Miami-Dade State Attorney’s Office where he tried numerous cases and argued several motions, acquiring a vast amount of litigation experience. Personal: Mr. Karkatselos played baseball at the collegiate and professional level. He also had the privilege to play for the Greek National Baseball Team in the 2010 European Championship, 2011 World Cup, and 2012 European Championship. Mr. Karkatselos was admitted to the Florida Bar in 2016.